HMH Books for Young Readers, 9780544540309, 256pp. Angel Morgan needs help. Daddy is in jail, and Mama has abandoned her and her little brother, leaving them with their great-grandmother. Grandma is aged and poor, and doesn’t make any attempt to care for the children—that’s left up to Angel, even though she is not yet twelve. The only bright spot in Angel’s existence is the Star Man, a mysterious stranger who appears on clear nights and teaches her all about the stars and planets and constellations. 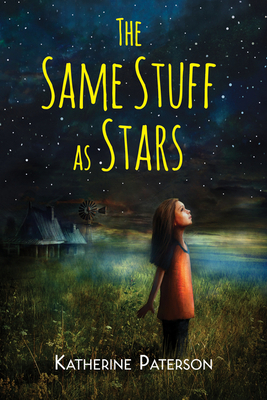 “We’re made out of the same stuff as the stars,” he tells her. Eventually, Grandma warms to the children and the three begin to cobble together a makeshift family. Then events in Angel’s life take yet another downturn, and she must once again find a way to persevere. Katherine Paterson’s international fame rests not only on her widely acclaimed novels but also on her efforts to promote literacy in the United States and abroad. A two-time winner of the Newbery Medal (Bridge to Terabithia and Jacob Have I Loved) and the National Book Award (The Great Gilly Hopkins and The Master Puppeteer), she has received many accolades for her body of work, including the Laura Ingalls Wilder Medal, the Hans Christian Andersen Medal, the Astrid Lindgren Memorial Award, and the Governor’s Award for Excellence in the Arts, given by her home state of Vermont. She was also named a Living Legend by the Library of Congress. She served as the National Ambassador for Young People's Literature in 2010-2011. Ms. Paterson is vice president of the National Children’s Book and Literacy Alliance (www.thencbla.org), which is a not-for-profit education and advocacy organization. The NCBLA’s innovative projects actively promote literacy, literature, libraries, and the arts. She is both an Alida Cutts Lifetime Member of the United States Board on Books for Young People (www.usbby.org) and a lifetime member of the International Board on Books for Young People (www.ibby.org). She and her husband, John, live in Montpelier, Vermont. They have four children and seven grandchildren. For more information, visit www.terabithia.com.